Juno is a space probe orbiting Jupiter since July 2016. It completed 10 science orbits in February 2018. After this 10th orbit, Juno sent some fascinating images of Jupiter's cloud cover. Gerald Eichstädt, a mathematician and software professional, extrapolated the cloud movement from the NASA images. This article claims, that these look a lot like hallucinations of people on LSD. 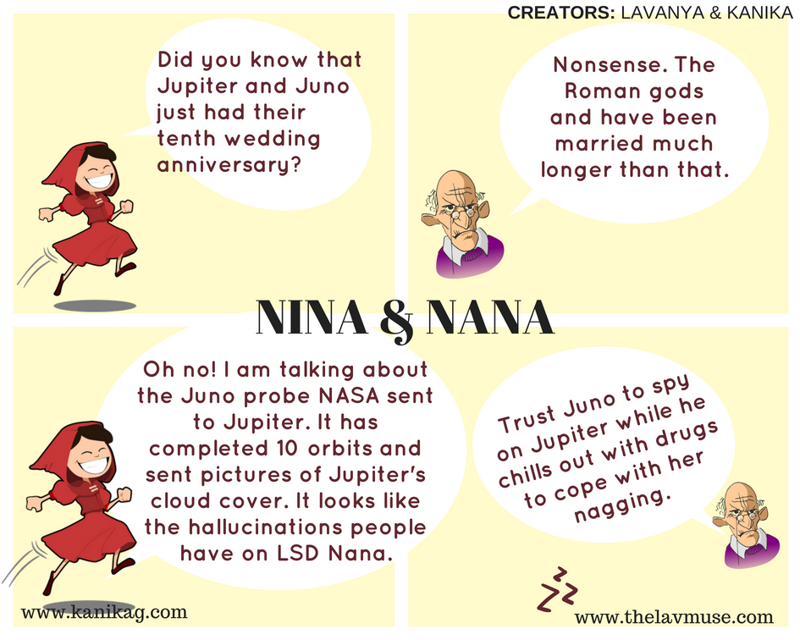 That's what inspired Lavanya and me to create this cartoon. Gotta love the scientists for their sense of humor. Juno the spacecraft too, is peering through Jupiter's cloud layers. To check out all the information and lovely images Juno has sent us so far, go to NASA's Juno page. You can find Lavanya's post here. The above gif image was obtained from Metro.